This chilli variety comes originally from the Caribbean and it is still very common there. 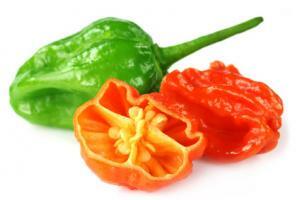 The Scotch Bonnet is one of the hottest chilies with 150,000-300,000 Scoville units. The fruity chilli is cultivated mainly in Jamaica, but enjoys great popularity far beyond the country. The Scotch Bonnet Chilli variety has its name by the appearance of the fruit. It is as wide as it is long and it looks like a typical tam. The Scotch Bonnet is often used to cook hot sauces. In the Caribbean kitchen, tropical fruits such as mango or papaya go very well with the Jamaican chilli. These fruits combine wonderfully with the flavor of the Scotch Bonnet, because the chilli itself has a note of apricot in addition to the extreme heat. The Scotch Bonnet chilli is the Caribbean version, and indeed the little cousin of the famous Habanero chilli. Its heat severity level reaches a strong bite with 100,000-350,000 Scoville, making it one of the hottest chilies in the world. In comparison - it is up to 140 times hotter than a Jalapeño pod. The Scotch Bonnet is called the Caribbean chilli, and not without a reason: its spicy flavor contains unique fruity sub-notes, which are described by many fans as an apricot-like, exotic sweetness, giving the chilli a fantastic twist. Anyone who has already tasted a Habanero can imagine the taste of Scotch Bonnet in a similar way, with the addition of the fruity sweetness associated with this style and in conjunction with an extreme heat that is nowhere to be found elsewhere. The Scotch Bonnet chilli is a sort of the type "Capsicum Chinense". With up to 5cm in size, however, it differs from its relatives, as it grows rather round and wide than long and it has many furrows. Because of this nature, it also got its name "Scotch Bonnet" and it is due to its shape, which is very reminiscent of a Tam O'Shanter Hat from Scotland. However, apart from the name, Scotch Bonnet has very little to do with Scotland. Quite the contrary! Its main cultivation area is located in Jamaica and the climate there allows it to grow up to 120 cm high. Anyone who cultivates the variety in colder latitudes however, can expect a slightly reduced growth spurt and therefore with a growth height of only up to 60 cm. The pod itself is, due to its thin outer shell, well suited for drying and smoking. Although not fleshy, the Scotch Bonnet has a juicy bite at harvest. After germination, the fruit matures in its original breeding from a green color to a deep yellow or even orange coloration, while other variants can assume even darker tones like brown. Originally from the Caribbean, the Scotch Bonnet can be found in many local dishes even today. There it can be found in any local supermarket or restaurant in one form or another, while procurement in our local supermarkets is often very difficult. Since its name does not connect them to the Caribbean at first glance, other names are circulating for the Scotch Bonnet on the Internet: "Bahama Mama", "Jamaican Hot" or "Bahamian" are more likely to give a hint about its origin. Its tropical, fruity and fiery nature make it a popular ingredient of many fruity hot sauces or Caribbean dishes. Many Scotch Bonnet recipes not only use the classic ingredients, but also fall back on tropical fruits. Very popular here are the papaya and mango. Its special aroma ideally complements the apricot sweetener's own taste, offering an interesting variation of the popular Hot Sauces. The fruit complements the fruity taste of the pod for a true tropical mix. The Scotch Bonnet is the ideal chilli pepper to experiment with fruits and sweet sub-nuts or to process them for the preparation of tropical pork dishes. The Scotch Bonnet chilli is often found in shops or restaurants with owners from a Caribbean region. Here in the Pepperworld Hot Shop we offer such a great variety of different tropical and interesting hot sauces and ingredients and of course you can also buy fresh Scotch Bonnet chilies under the name "Jamaican Hot". By the way, you can find more fresh chilies here. In order to cultivate the Scotch Bonnet in colder latitudes, an optimal temperature of at least 22 ° C to 28 ° C for the germination period of 12 to 21 days must be maintained. 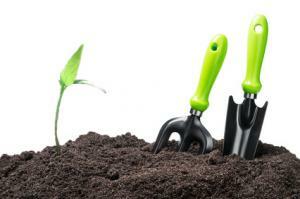 The plant needs a fresh, well-fertilized and well-drained soil and should be protected in any case from waterlogging. The Scotch Bonnet plant needs at least 6 hours per day, but prefers more, direct sunlight. If there is not enough sun, you can switch to a plant lamp. We recommend placing the plant in a Greenhouse or use a heating mat in order to achieve the required temperatures to germinate. In addition, the pot and the greenhouse make it possible to expose the plant to the sun for the required time. The black pot attracts extra heat from the sun. If the temperature falls below 12 ° C, the pot can be moved in easily, or the greenhouse can be heated and the plant remains protected. This also applies to the germination time at night. The plant should never be exposed to temperatures below 12 ° C. A Scotch Bonnet can survive the winter in colder latitudes, like most chilies, but needs the right help. It is best if the plant is cut to 20cm and stored at a minimum of 15 ° C during the winter. With proper care and cultivation, a Scotch Bonnet plant can be used successfully for several years to grow the Caribbean pod at home. The harvested pods are quite thin-walled, but juicy and are therefore ideal for drying. However, the sweet, tropical flavor suffers slightly from heating or smoking and loses some of the sweetness in the taste. We therefore recommend to try some of the pods fresh to experience the full potential of the Scotch Bonnet. In traditional Caribbean dishes, the Scotch Bonnet is put into the pot as a whole pod, or used as pepper, while its cousin, the Habanero, often gives its heat to the dishes in a chopped form. Adding it in its unmodified form, the Scotch Bonnet gives its unique flavor to the dish, without putting it in extreme heat and it also offers its sweet undertone. Anyone who cuts and cooks the Scotch Bonnet, on the other hand, should not expect a too fruity flavor. Instead, the pungency of the pod is taken by the dish while the tropical sweetness is lost through cooking. The Scotch Bonnet can be found in many different variants: From Tobago Scotch Bonnet to Scotch Bonnet Chocolate, all variants are served. Depending on the variety, the plant also takes on a different color. For example, the Scotch Bonnet chocolate variety when matured, it takes on a chocolate brown finish, while other varieties already reach their full intensity in their yellow coloration. Another variety grown on the Caribbean islands is the Cachucha. The Cachucha of Scotch Bonnet is a very sweet variety of pods and it is mainly used in conjunction with tropical fruits. Attention! With scores of 100,000 to 350,000 Scotch Bonnet is not the hottest chilli on the market, but it should be treated with care! Avoid contact with the eyes and other mucous membranes. Wash your hands well after processing! If the skin is irritated, the heat of the chilli, can be neutralized with a little oil. Even for experienced hot taste loving consumers - beware of the dosage. The Scotch Bonnet can be found here in the Pepperworld Hot Shop as Seeds, Sauces and in fresh form It can be purchased in different variants! Whether as a tropical hot sauce, dried fruit to spice up dishes or as a seed, the Scotch Bonnet is a true treasure in the tropical kitchen. Those who would like to give their dishes a fruity undertone with a real bite, will definitely make the right choice with the Scotch Bonnet. Here in the Pepperworld Hot Shop you can find the right mix of fruity tropics with exotic heat for every taste! Scotch Bonnet Chilies blend with Caribbean spices to a taste experience just like under the palm trees! Try the Caribbean fiery gourmet hot sauce with scotch bonnets - the fiery, Caribbean cousin of the habaneros. NEW - Cult sauce that is not only present in the fetish scene and makes for a good bad taste present! In the USA this Hot Sauce can be found again and again in the rankings! Scotch Bonnet variant from Costa Rica. Hotter and more fruity in taste, than the usual varieties. 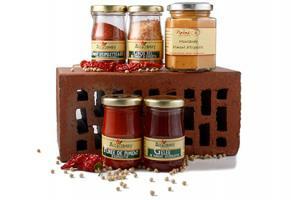 Ideal for sauces and dips. Tiki Bar with its fruity notes goes a step higher. This heated up version is the right thing for those who like it hot. A round with some serious fire. Some of the hottest chilies are united in this sauce. Burn, baby, burn! Five super-hot Caribbean chilies are united in a hot sauce. Simply wonderful! Scotch Bonnet - hot tote of the Caribbean! 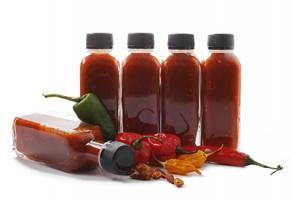 This article deals with a really very spicy and exceptional chilli, the Scotch Bonnet. Learn in the following paragraphs, for example, where the plant originates from and to which botanical species it actually belongs to! What exactly does the Scotch Bonnet chilli look like? Where does this chilli type come from? Originally, Scotch Bonnet is native to the Caribbean, more specifically, Jamaica. Since the variety is closely related to the Habanero, it is sometimes referred to as "Caribbean Habanero". To this day, Jamaica is one of the main growing areas worldwide, for the Scotch Bonnet. To what variety of Chilli does the Scotch Bonnet belong to? The variety Scotch Bonnet belongs to the Art Capsicum Chinese, which can already be recognized by the, already mentioned, furrowed form of chilies. A peculiarity of this kind is the really extreme heat, which the chilies develop. Of course, this also applies to the Scotch Bonnet variety. For this reason, you should always protect yourself when handling these chilies, for example by wearing gloves. All plants of this species, with only about one meter in height, are not particularly large, but the crops are still very productive due to the bushy growth. Capsicum Chinese prefers a sunny or half shady site. When the Scotch Bonnet pods are freshly harvested, they are particularly juicy, even though they are not very thick-bodied. The said harvest takes place in Capsicum chinese a little earlier than in other types, since the maturity of the chilies is relatively short. This is very good, as we find, because every year, very early, we can enjoy the extremely hot bulkhead hats. The plants need a lot of heat! 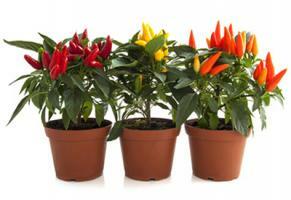 Due to their Caribbean origin, the Scotch Bonnet plants are used to very warm and humid conditions. For this reason, you will get the best possible result at the harvest if you meet these requirements as well as possible. Of course, it is possible to simulate the tropical, climatic conditions in a greenhouse. In such a greenhouse, this works best, because the energy of the sun is stored in the interior, at the same time a high humidity is automatically formed. If you do not have a greenhouse available, you should in any case, as indicated above, provide for a sunny and warm location, so that the plant can produce as many, hot bulkhead hats. How is the variety used? 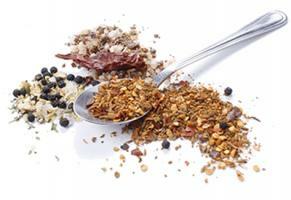 and everything you want "spiced up"
The heat is really not to be underestimated! That the Scotch Bonnet variety is really hot, we do not have to mention again. We would rather give you some tips on how to deal with this heat. For example, what can you do about making your own salsa not taste too hot? The answer is amazingly simple. This works by simply stretching the sauce with the remaining ingredients. If that does not work, fat is always a very good way to bind the capsaicin, therefore the heat. This means you can put some milk, cream or oil in the dish. The addition of a raw potato, can reduce the heat, but you must not forget to remove it again, it should not be overcooked. If it's already too late, because you can feel the heat of the finished food in the mouth, fat is also the best choice to diminish the effects. To remedy this, you should drink milk in such cases, never water! Also, yogurt or bread really helps wonderfully, if you should have misjudged the extreme heat of the Scotch Bonnet. The Scotch Bonnet fruits are slightly wider than they are long, and this unusual shape is one of the reasons why the variety was baptized by its extraordinary name. Botanically, the hot tartan hat belongs to the type Capsicum chinese, which explains the very strong heat of the fruits. 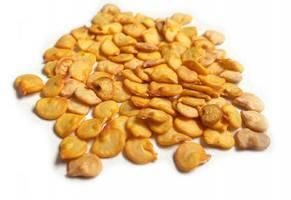 Other features of this kind are, for example, the small size and a high-yield crop. Mainly the Scotch Bonnet fruits are processed into hot sauces and salsas, but the fruity taste, which is very similar to that of the apricot, can also be creatively used in cooking. In its area of origin, the Caribbean, the spicy chilli variety is used in many recipes. When you handle this really fiery fruit, be sure to take the necessary safety measures, such as wearing gloves. If you underestimate the heat, there are ways to mitigate it. If you want to order your own seeds in our Pepperworld Hot Shop, you should take in consideration that the Scotch Bonnet comes from the Caribbean and therefore it requires a lot of heat and humidity for optimal growth.